The motherboard is the main circuit board inside the PC. It holds the CPU and memory, provides expansion slots for peripherals, and, whether directly or indirectly, connects to every part of the PC. 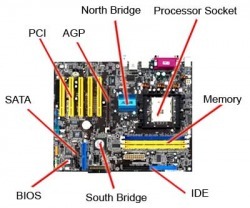 The essential motherboard make-up includes the chipset (known as the "glue logic"), some code in ROM and the various wired interconnections between the components know as buses. The chipset is fundamental, and controls how the motherboard interacts with everything else in the system. A good chipset can be more important than the power of CPU or the amount of RAM. The ROM code includes the BIOS, which has user-changeable options for how the motherboard operates with integral and connected devices. The buses are the electrical wires that connect everything together. 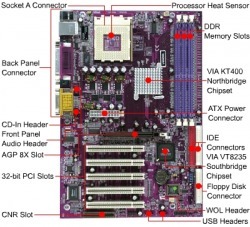 Motherboard designs use many different buses to link their various components. For instance, wide, high-speed buses are difficult and expensive to produce. The signals travel at such a rate that even distances of just a few centimetres cause timing problems, while the metal tracks on the circuit board act as miniature radio antennae, transmitting electromagnetic noise that introduces interference with signals elsewhere in the system. For these reasons, design engineers try to keep the fastest buses confined to the smallest area of the motherboard and use slower, more robust buses for other parts. However, the motherboard is perhaps the most fascinating and certainly most integral component of the PC. Every PC's multimedia graphic and sound capabilities, type and performance of CPU and support for type and capacity of RAM are governed by their motherboards. On the next page, we'll look at how this powerful component evolved. ­­­Motherboards have come a long way in the­ last twenty years. The first motherboards held very few actual components. The first IBM PC motherboard had only a processor and card slots. Users plugged components like floppy drive controllers and memory into the slots. Today, motherboards typically boast a wide variety of built-in features, and they directly affect a computer's capabilities and potential for upgrades. Another important component is the basic input/output system (BIOS) chip which contains startup programs such as the power on/self-test (POST) and drivers of the computer. This chip controls communication between the systems hardware and operating system. BIOS can also be referred to as firmware. In a computer system, the CPU needs information and instructions to perform properly. This information and instructions for the CPU are stored in Random Access Memory (RAM). This memory is sometimes referred to as Primary Memory or Main Memory. Until up to a few years ago, printers were connected to parallel ports but now they are being replaced with the faster USB port. Low speed peripherals such as modems, mice and some scanners were connected to the serial port. Again, this port is being replaced by the USB port which can support up to 127 devices. The SCSI bus can also support a number of peripherals such as hard disks, tape drives, CD-ROM drives, scanners, etc. This is a 20-pin male connector located on the computer motherboard. The power supply is plugged into this connector which supplies power for the motherboard, its components and some peripherals. 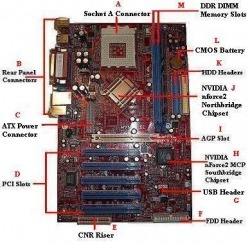 Today, most of the motherboards manufactured include integrated graphics, audio and LAN. Motherboards are designed to provide different data transfer rates. First time computers used the UDMA/33 interface but this was increased to UDMA/66 which doubled the data-transfer rate. These characteristics apply to Parallel ATA hard drives. For a long time, the UDMA/133 remained the fastest interface until the inception of the Serial ATA drive which has a data transfer rate of 150MBS/sec. These have now improved to data transfer rates of 300MBS/sec.